Posted on November 18, 2011	by Lou Murray, Ph.D. I have two recipes to share today. The first is onion puree. I have already used all of my homegrown onions, so I had to use store-bought. But the garlic and parsley were my own. 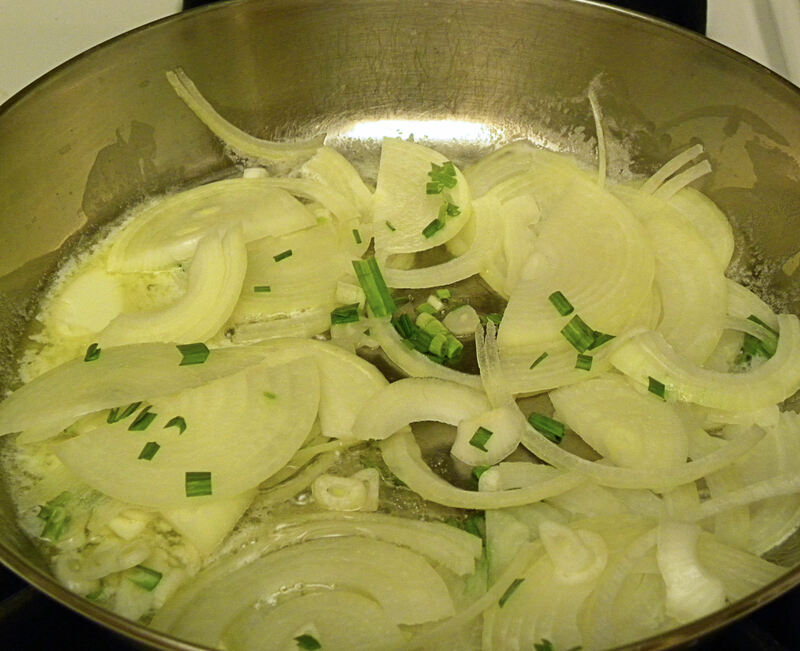 Saute one sliced yellow onion and four cloves of garlic in 2 T butter. As soon as the onions turn translucent, add 1 C chicken broth, cover, and simmer for 20 minutes. Puree in a blender or food processor. Return to pan, add 1/2 tsp dry tarragon, and simmer uncovered until reduced to a thick sauce. Add 1/4 to 1/2 C chopped parsley. Serve on steak, a roast, or whatever. I think that this onion puree could be easily changed by substituting cumin, curry, paprika, etc. for the tarragon. As it is, it’s like a lo-cal Sauce Bernaise. Onion puree is at the top next to the grilled steak. The broccoli and cauliflower stir fry above is really fabulous. Slice broccoli and cauliflower and 3 cloves garlic. Saute quickly in 2 T olive oil and 1 tsp sesame oil until vegetables are browned. Season with sea salt or Himalayan pink salt. This dish is so good you won’t believe it. Komatsuna on top, Mizuna on bottom, sprouted garlic at lower right. 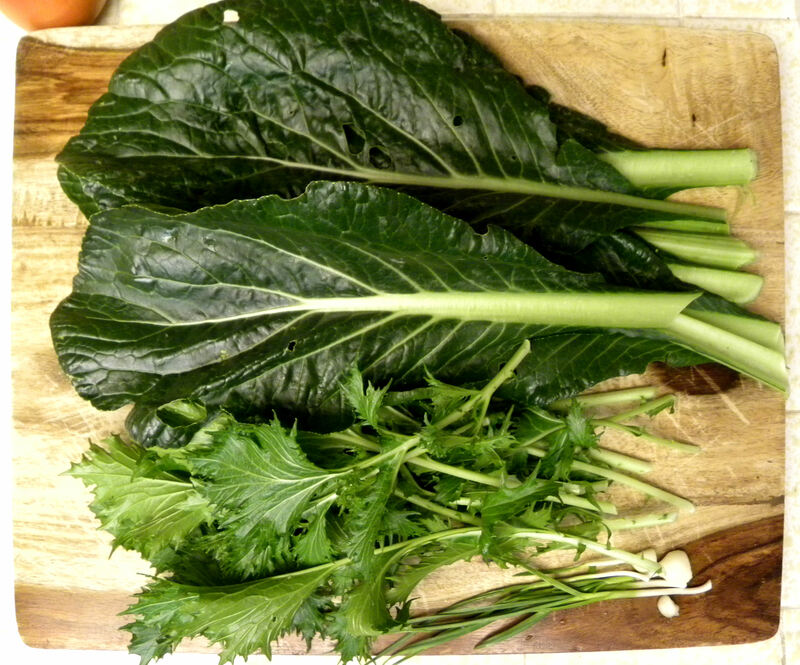 These greens are Japanese mustard greens, great in stir frys and soups. My garden is producing mizuna and komatsuna in abundance, so I’m looking for new ways to use them. They went into the bean soup below. The garlic doesn’t have to be sprouted. I just harvested these a bit late and they had started growing again. The tender garlic greens are edible at this young stage. My husband brought back a bag of dry European soldier beans from a specialty market in the San Francisco Bay area recently. The beans were large and cream colored, with the markings of a red toy soldier at the hilus. They are a New England heirloom bean, also known as Red-eyes, and are often used for baked beans. 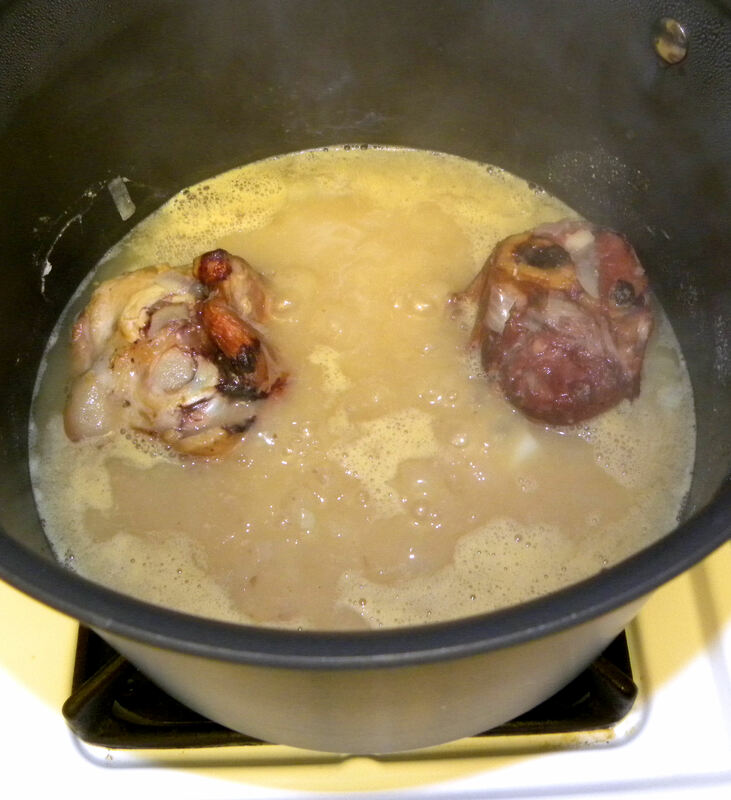 I wanted to make soup out of them. It was the best bean soup I’ve ever eaten. 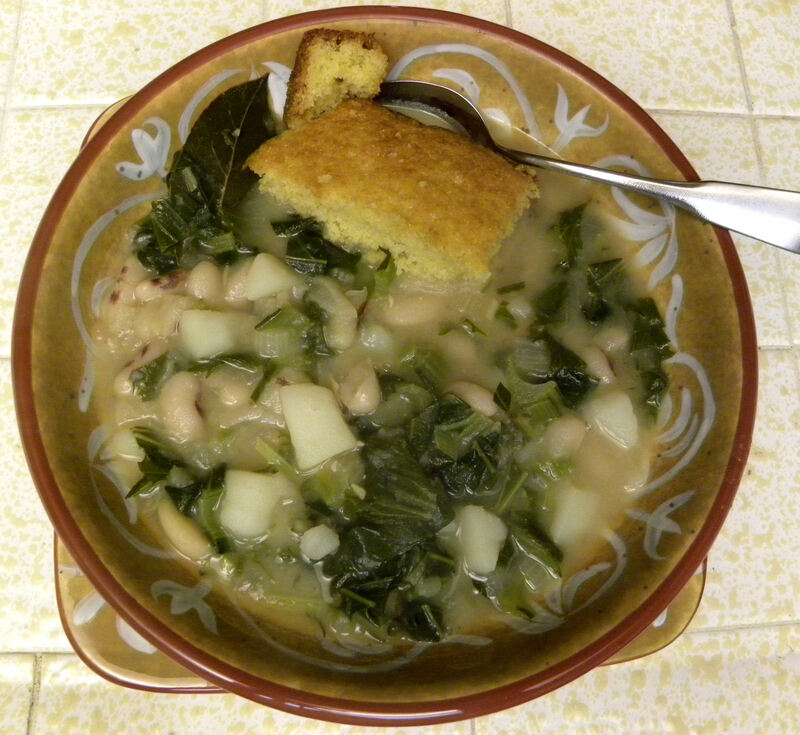 The beans cooked quickly, the red color stayed, and the beans were fabulous–creamy not mealy with a wonderful, slightly sweet, beany flavor. I am saving some of these beans to grow in my garden next year. You can also buy them from Vermont Bean Company, and probably other seed vendors as well. Pour boiling water over 1 C washed Soldier Beans and let soak for 1.5 hours. Drain water off and discard. Put beans back in pan, add 5-6 cups of chicken broth, 1 chopped onion, 3 cloves of garlic, 1 diced large potato, 1/2 tsp ground coriander, 2 bay leaves, and a ham hock. Simmer for 1-1.5 hours. Remove two cups of soup, puree in a blender and add back to the pot. Add 3-4 C chopped greens. Cook 30 minutes more until greens are done. Serve with cornbread. I am so impressed with Soldier Beans that I’m definitely growing my own next summer. They come in either pole or bush. Since mine came in a bag destined for soup, I have no idea what kind they are. The label says European Soldier Beans, so maybe this is a European cultivar. I don’t have time to post a photo of the dry beans. I’m late for work. If you have produce that you cooked this week, visit Robin at the Gardener of Eden. 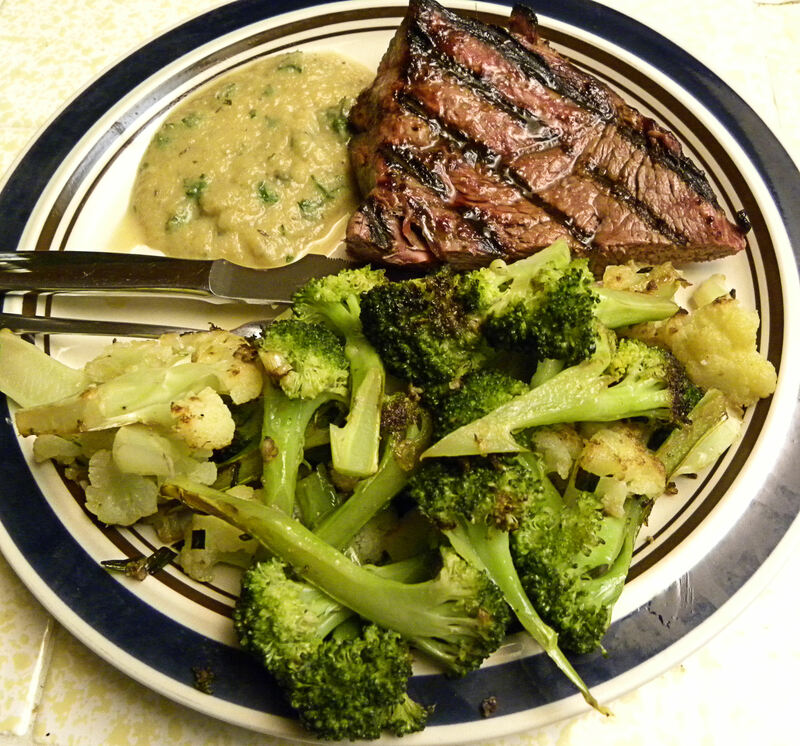 This entry was posted in Uncategorized and tagged bean soup, broccoli, cauliflower, garlic, onion puree, recipe, Soldier beans, stir fry. Bookmark the permalink. I am looking for a good bean that will grow quickly and not take up a lot of room. May just have to look into these. Wilderness, I bought some bean towers for the garden this summer. They take up very little space, and look nice as well. I didn’t get anywhere near the harvest poundage claimed for them, but there’s always next year. Boy I wish that I had a steak to cook tonight! That picture makes me hungry for one! The onion puree is a great idea. I just love cooked onions. I’m definitely going to try this recipe. The soup looks great too! Robin, there is nothing like a grilled steak. Unless it’s a grilled portabello mushroom. We are committed carnivores, but eat many vegetarian meals. That bean soup looks delicious. Must look for those beans. Love your onion puree idea. Thanks for sharing the recipes. Norma, I have never seen Soldier Beans for sale at any of the places I shop. Maybe they’re more common on the east coast. Well all of it looks delicious – but the onion puree would definitely be a hit in this household. I like to cook sauteed onions and red peppers and serve with (or on top) of grilled steaks. The taste is fabulous and yet it is so simple to do. Laura, the addition of red bell peppers would be great. Um, fire-roasted red peppers. I see another dish coming up. Liz, I was skeptical when I saw the recipe, but it was great. I’m going to guess that they are bush beans. Most commercial beans are. I’m think going to buy some dried beans from Baen’s Beans which is a Massachusetts bean farm not far from me. I figure they all probably grow well here since they were raised here. But I’m sure they are all bush beans. Good to know, Daphne. That was my guess too, but my guess was random. Yours sounds informed. I’ll plant them like bush beans and we’ll see what happens.